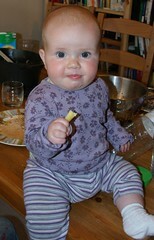 Anna and Amaia's blog: Chips anyone? Mum was very surprised last night when I ate an adult chicken rogan josh curry liquidized. She thought it was a bit strong for a 6 month old baby. Tonight she was equally surprised when I started munching my way through Léon's chips. This time I managed to chew them myself without the liquidizer! Who needs teeth?